Definition at line 69 of file lloctree.h. Definition at line 73 of file lloctree.h. Definition at line 77 of file lloctree.h. Definition at line 76 of file lloctree.h. Definition at line 75 of file lloctree.h. Definition at line 74 of file lloctree.h. Definition at line 83 of file lloctree.h. References LLOctreeNode< T >::mCenter, LLVector3d::mdV, LLOctreeNode< T >::mOctant, LLOctreeNode< T >::mParent, and LLOctreeNode< T >::updateMinMax(). Definition at line 101 of file lloctree.h. References LLTreeNode< T >::destroyListeners(), and LLTreeNode< T >::mState. Definition at line 109 of file lloctree.h. References LLOctreeState< T >::balance(), and LLOctreeNode< T >::getOctState(). Referenced by LLSpatialBridge::LLSpatialBridge(), and LLSpatialBridge::updateMove(). Definition at line 194 of file lloctree.h. References LLVector3d::mdV, LLOctreeNode< T >::mParent, LLOctreeNode< T >::mSize, NULL, and size. Definition at line 189 of file lloctree.h. Referenced by LLOctreeState< T >::getNodeAt(), LLOctreeState< T >::insert(), and LLSpatialGroup::updateInGroup(). Definition at line 126 of file lloctree.h. References LLOctreeState< T >::deleteChild(), and LLOctreeNode< T >::getOctState(). Referenced by LLOctreeState< T >::checkAlive(). Definition at line 117 of file lloctree.h. References LLOctreeState< T >::destroy(), and LLOctreeNode< T >::getOctState(). Definition at line 105 of file lloctree.h. Referenced by LLOctreeState< T >::addChild(), LLOctreeRoot< T >::insert(), LLOctreeState< T >::insert(), LLSpatialGroup::LLSpatialGroup(), and LLSpatialGroup::shift(). Definition at line 113 of file lloctree.h. References LLOctreeState< T >::getChild(), and LLOctreeNode< T >::getOctState(). Definition at line 112 of file lloctree.h. Referenced by LLOctreePick::check(), LLOctreeState< T >::getNodeAt(), LLSpatialPartition::processOcclusion(), LLSpatialGroup::rebound(), LLRelightPainter::traverse(), and LLSpatialGroup::validate(). Definition at line 111 of file lloctree.h. References LLOctreeState< T >::getChildCount(), and LLOctreeNode< T >::getOctState(). Definition at line 114 of file lloctree.h. References LLOctreeState< T >::getElementCount(), and LLOctreeNode< T >::getOctState(). Referenced by LLOctreeState< T >::insert(), LLSpatialGroup::rebound(), and LLSpatialGroup::updateInGroup(). Definition at line 119 of file lloctree.h. References LLOctreeState< T >::getNodeAt(), and LLOctreeNode< T >::getOctState(). Definition at line 118 of file lloctree.h. Referenced by LLSpatialPartition::put(), and LLDrawPoolBump::renderActive(). Definition at line 128 of file lloctree.h. References LLOctreeNode< T >::mCenter, LLVector3d::mdV, LLOctreeNode< T >::OCTANT_POSITIVE_X, LLOctreeNode< T >::OCTANT_POSITIVE_Y, and LLOctreeNode< T >::OCTANT_POSITIVE_Z. Definition at line 120 of file lloctree.h. Referenced by LLOctreeState< T >::getNodeAt(). Definition at line 184 of file lloctree.h. Referenced by LLOctreeState< T >::addChild(), and LLOctreeState< T >::removeChild(). Definition at line 125 of file lloctree.h. Definition at line 124 of file lloctree.h. Referenced by LLOctreeState< T >::checkAlive(), LLSpatialGroup::getParent(), LLOctreeState< T >::insert(), LLOctreeState< T >::remove(), LLSpatialGroup::updateInGroup(), and validate_occlusion_list(). Definition at line 123 of file lloctree.h. Definition at line 122 of file lloctree.h. Referenced by LLOctreeNode< T >::balance(), LLSpatialGroup::boundObjects(), LLOctreePick::check(), LLOctreeNode< T >::deleteChild(), LLOctreeNode< T >::destroy(), LLOctreeNode< T >::getChild(), LLOctreeNode< T >::getChildCount(), LLSpatialGroup::getData(), LLOctreeNode< T >::getElementCount(), LLOctreeNode< T >::getNodeAt(), LLOctreeNode< T >::hasLeafState(), LLOctreeNode< T >::removeByAddress(), LLOctreeRenderNonOccluded::traverse(), and LLOctreeNode< T >::validate(). Definition at line 103 of file lloctree.h. Referenced by LLSpatialGroup::boundObjects(), LLOctreeState< T >::getNodeAt(), LLOctreeNode< T >::getOctParent(), and LLSpatialGroup::unbound(). Definition at line 106 of file lloctree.h. Referenced by LLOctreeState< T >::addChild(), LLOctreeState< T >::getNodeAt(), LLOctreeRoot< T >::insert(), LLOctreeState< T >::insert(), LLSpatialGroup::LLSpatialGroup(), LLSpatialBridge::updateBinRadius(), LLSpatialGroup::updateDistance(), and LLSpatialGroup::updateInGroup(). Definition at line 116 of file lloctree.h. References LLOctreeNode< T >::getOctState(), and LLOctreeState< T >::isLeaf(). Definition at line 158 of file lloctree.h. 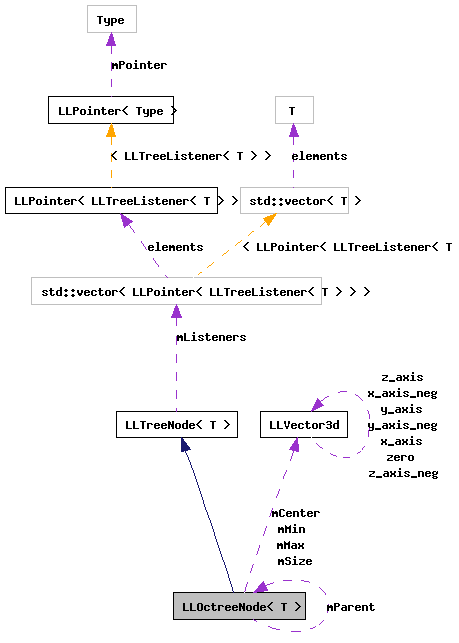 References LLVector3d::mdV, LLOctreeNode< T >::mMax, LLOctreeNode< T >::mMin, x, y, and z. Definition at line 153 of file lloctree.h. Definition at line 148 of file lloctree.h. References LLVector3d::mdV, and LLOctreeNode< T >::mSize. Referenced by LLOctreeState< T >::getNodeAt(), LLOctreeRoot< T >::insert(), LLOctreeState< T >::insert(), LLOctreeNode< T >::isInside(), LLOctreeState< T >::remove(), and LLSpatialGroup::updateInGroup(). Definition at line 208 of file lloctree.h. References i, LLVector3d::mdV, and size. Referenced by LLOctreeRoot< T >::insert(), and LLOctreeState< T >::insert(). Definition at line 115 of file lloctree.h. References LLOctreeNode< T >::getOctState(), and LLOctreeState< T >::removeByAddress(). Referenced by LLOctreeState< T >::remove(). Definition at line 107 of file lloctree.h. Referenced by LLOctreeRoot< T >::balance(), LLOctreeRoot< T >::insert(), and LLSpatialGroup::shift(). Definition at line 121 of file lloctree.h. Definition at line 104 of file lloctree.h. Definition at line 108 of file lloctree.h. References LLOctreeNode< T >::mSize, and size. Referenced by LLOctreeRoot< T >::balance(), and LLOctreeRoot< T >::insert(). Definition at line 174 of file lloctree.h. References i, LLOctreeNode< T >::mCenter, LLVector3d::mdV, LLOctreeNode< T >::mMax, LLOctreeNode< T >::mMin, and LLOctreeNode< T >::mSize. Referenced by LLOctreeRoot< T >::balance(), LLOctreeRoot< T >::insert(), LLOctreeNode< T >::LLOctreeNode(), and LLSpatialGroup::shift(). Definition at line 110 of file lloctree.h. References LLOctreeNode< T >::getOctState(), and LLOctreeState< T >::validate(). Definition at line 226 of file lloctree.h. Referenced by LLOctreeNode< T >::getCenter(), LLOctreeNode< T >::getOctant(), LLOctreeNode< T >::LLOctreeNode(), LLOctreeNode< T >::setCenter(), and LLOctreeNode< T >::updateMinMax(). Definition at line 228 of file lloctree.h. Referenced by LLOctreeNode< T >::isInside(), and LLOctreeNode< T >::updateMinMax(). Definition at line 229 of file lloctree.h. Definition at line 230 of file lloctree.h. Referenced by LLOctreeNode< T >::getOctant(), LLOctreeNode< T >::LLOctreeNode(), and LLOctreeNode< T >::setOctant(). Definition at line 225 of file lloctree.h. Referenced by LLOctreeNode< T >::contains(), LLOctreeNode< T >::getParent(), LLOctreeNode< T >::LLOctreeNode(), and LLOctreeNode< T >::setParent(). Definition at line 227 of file lloctree.h. Referenced by LLOctreeNode< T >::contains(), LLOctreeNode< T >::getSize(), LLOctreeNode< T >::isInside(), LLOctreeNode< T >::setSize(), and LLOctreeNode< T >::updateMinMax(). Definition at line 79 of file lloctree.h. Referenced by LLOctreeNode< T >::getOctant(). Definition at line 80 of file lloctree.h. Definition at line 81 of file lloctree.h.